On 21 April 2016 the Minister for Economic Development, Mr Ebrahim Patel delivered his annual budget speech in Parliament and CapeRay was invited to hear him speak. The reason for the invitation is that our majority shareholder, the Industrial Development Corporation (IDC) reports to the Minister. 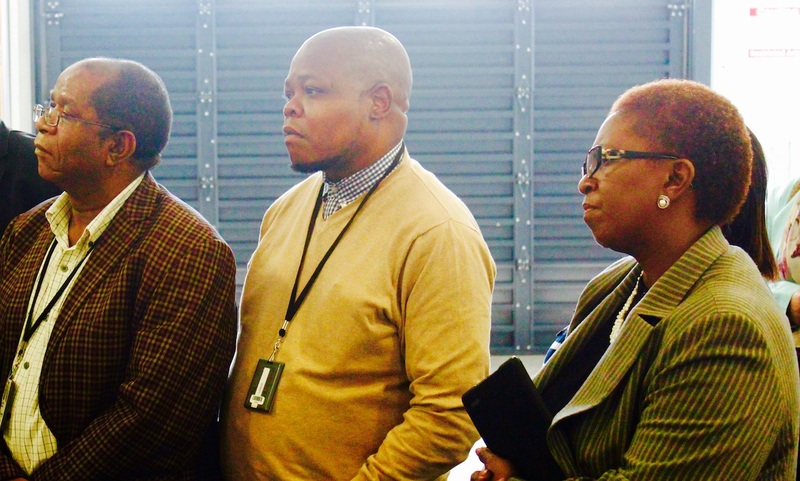 Yesterday we had an opportunity to reciprocate when we hosted the Portfolio Committee on Economic Development which is chaired by Mrs Elsie Mmathulare Coleman, seen above right with two of her committee members. Ten questions framed his talk: (1) Who is CapeRay? (2) What is the challenge? (3) What is our solution? (4) What are the benefits? (5) How big is the opportunity? (6) What about the competition? (7) What intellectual property do we own? (8) How does screening work? (9) What’s our value proposition? (10) What’s in it for South Africa? It was the final two questions that really caught the portfolio committee’s attention. As seen in the table at left, we will sell our dual-modality Aceso system in South Africa for R3.5 million (about $250,000). Since it takes just 10 minutes to acquire both full-field digital mammography (FFDM) and automated breast ultrasound (ABUS) images, the annual throughput for one machine will be 10,000 women. Because the cost to screen one woman is R250 in the public health service, the annual running costs will be R2.5 million. We anticipate Aceso will detect 36 breast cancers that would normally be missed (i.e. 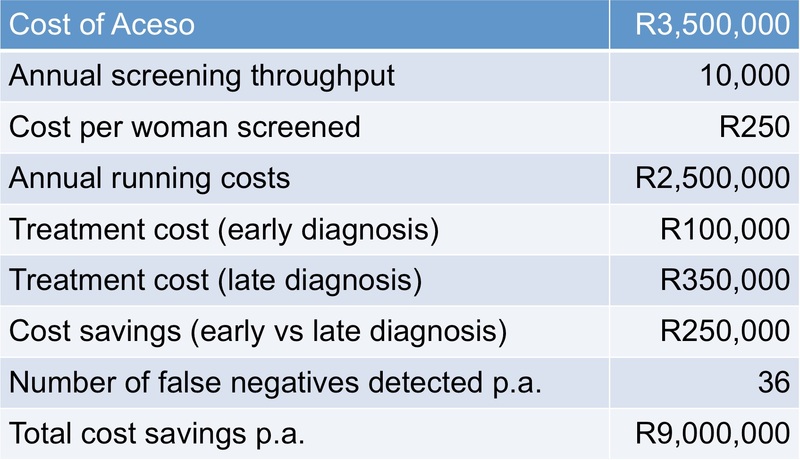 false negatives), so that a cost savings of R250,000 per patient – the difference between treating an early vs late diagnosis – would yield a cost savings of R9 million per annum. After Kit’s presentation the committee toured CapeRay’s facilities and met the staff. Roland Baasch demonstrated the power of dual-modality imaging with examples from our recent clinical trial, while John Harverson explained the features of our hermetically sealed breast platform. Leah Morgan and James Long were busy building the gantry, Ameen Jakoet was testing the wireless foot pedals, and Mike Mingay provided an overview of the central control software. After two hours at CapeRay the delegation hurried off to its next visit at the Atlantis Foundries. HAVE JUST SPOKEN TO MARGIE CLIFF, DOCTOR JUDITH SALERNO`S SECRETARY, DR.SALERNO IS THE CEO AND PRESIDENT OF SUSAN G KOMEN. SHE IS GOING TO RELAY MY INFORMATION ABOUT CAPE RAY AND PROFESSOR DAN KOPANS INTEREST IN COLLABORATING IN GETTING A DBT /US MACHINE BECOME A RELITY! KIT, PLEASE SEND OFF THE FORM, I SENT YOU, TO TED. TED IS MOST ANXIOUS TO HAVE YOU ON HIS SHOW, AS A RESULT OF ALL THE INFORMATION I SENT HIM ABOUT A MAMMOGRAPHY MACHINE THAT CAN DETECT UP TO 95% OF BREAST CANCERS! GO FOR IT BOETIE! THIS IS SOMETHING POTENTIALLY HUGE.